The Convent of San Juan de los Reyes, in Toledo, was built under the patronage of the Catholic Monarchs with the intention of turning it into a royal mausoleum, commemorating the battle of Toro and the birth of the prince Juan. The building was commissioned to Juan Guas in 1476, who built one of the most beautiful temples in the city of Toledo and one of the best sets of the Hispanic-Flemish Gothic. Toledo was chosen as the site for building the monastery due to its central geographic location and because it had been the capital of the ancient Visigoth kingdom, symbolically reconstituted by Isabella and Ferdinand with the restoration of the lost unity of Spain, through the union of Castile with Aragon. A fire during the French invasion in 1808 destroyed the original altarpiece, the library and the building of the community that contained a second cloister with plateresque decoration. After the sale of church lands in the 19th century, that deprived the church from its goods, the friars were expelled, the church was turned into the San Martin de Tours parish, whose primitive temple was demolished for being in ruins, and the cloister was transferred to install a museum. In 1954 the Franciscan community returns and in 1977 the parochial life in San Juan de los Reyes was recovered. Its church is in the form of a Latin cross, with short arms, an elongated nave (approximately 50 metres in length, and 30 metres high), and side chapels situated between the domed arches – three chapels on either side of the nave, and two more under the choir. Its cloister has a small garden. The ground floor’s ceiling is formed of German cross vaults set with figures of saints interspersed with animal and plant motifs, all created by the Toledo sculptor Cecilio Béjar in the 20th century. Its upper cloisters, first completed in 1526 and restored in the 19th century, contain Mudéjar ornamentation. We enjoy very much this visit. The monastery is within the offer “Tourist bracelet”, with which you can visit 7 monuments at the price of 10€ and you can access a free audio guide via your mobile phone. I had this article prepared from my recent visit to Toledo and I think it might fit well in this week’s challenge on History that Patti has thrown at us. This entry was posted in Colour, Photo challenge, Places, Places in colour and tagged fujifilmx, lens-artists, Monastery, Photography, Toledo, Tourism, Travel. Bookmark the permalink. 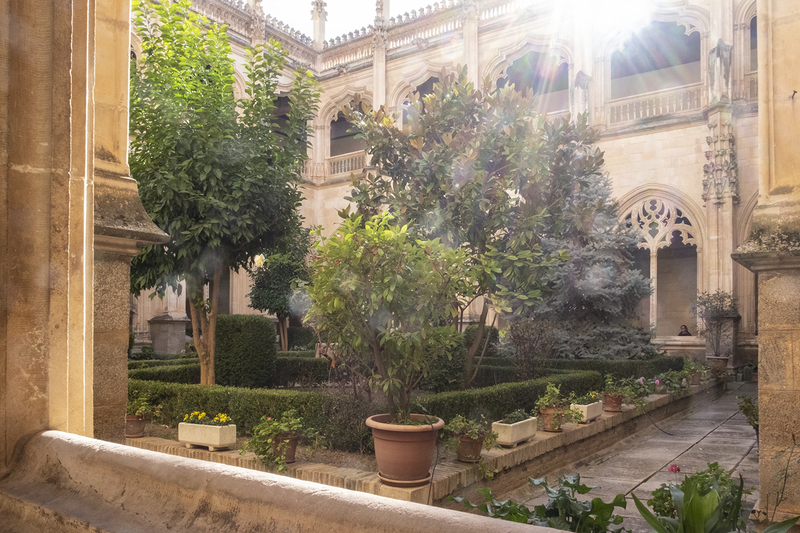 The Gothic cloisters in Spain are just beautiful. I think I would have liked being a monk! Haha sure! Kind of like Yoda on Dagobah. Beautiful tour of this highlight of Toledo. I love the architecture. A perfect fit indeed Ana, beautiful! Great photos of this architecture. Thank you for this enjoyable and educational tour, Ana! 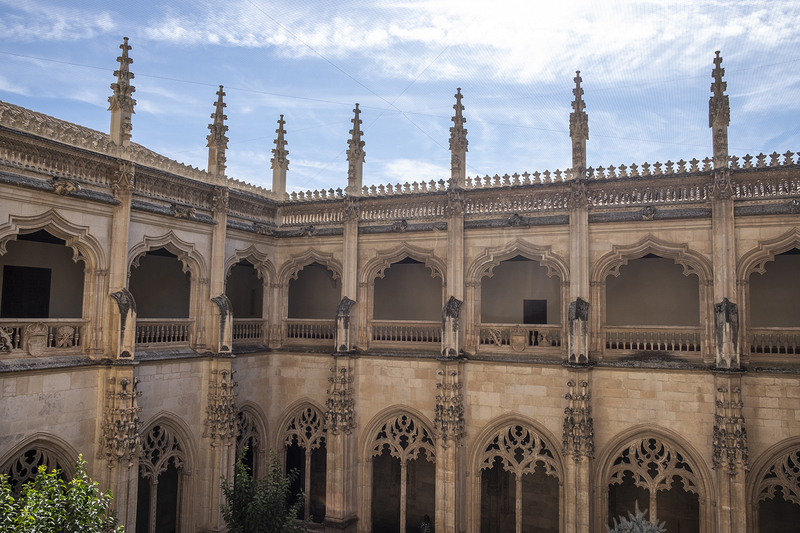 Toledo is so very beautiful – magnificent architecture and history pictured so well.